In an effort to protect our products from damage during transit, ITM4 has implemented a quality control measure that tells our customer’s receiving department if the load has been tampered with. This past year we have had a number of freight issues with carriers, and we have had to replace doors that were damaged in transit and repackaged to conceal the damaged doors inside the load. 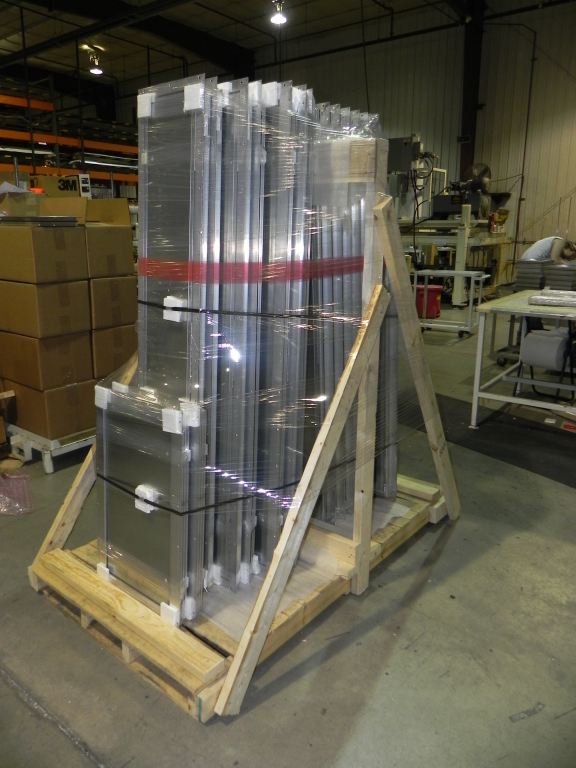 Clear shrink wrap is common so most receiving departments would not be able to detect if doors were repackaged. This required ITM4 to rebuild doors and customer orders were delayed. We see this RED stripe as a deterrent to concealed damaged doors and a savings for both our customers and ITM4. As you can see in the photo below, all the doors are properly crated and then a RED shrink wrap stripe is put on before the load is clear shrink wrapped. If the RED stripe is missing, then this is an indication that the doors were repackaged in transit and there could be concealed damage. If our customers get a crate of doors with no RED stripe on it, we ask them to write it up as a freight issue until all doors are inspected. In November 2010, our Genesis and Apex Plus access doors were tested by an independent lab with near ZERO LEAKAGE up to 15” of water column pressure.